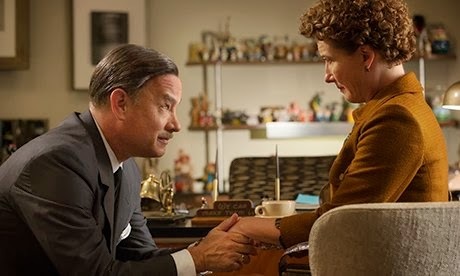 Unless you are living under a rock, you probably went to go see Saving Mr. Banks in the last few weeks. I was glad to be warned ahead of time that this was not a sweet and happy film about the making of a sweet and happy film I remember from my childhood. I was told it was long, sad, the main character was an awful human being and was told to bring tissues. I’ve decided I prefer being mentally prepared like that, because I liked the movie, and I’m convinced it’s because I knew what I was getting myself into when I walked into the theater. So I was able to look closer, which is one of my favorite things to do at the movies, and find beauty in the mess. This time, though, I feel like it created a mess in my life. But I’m thinking it’s a mess that needed to be created. When Walt flies to Europe at the end to see Mrs. Travers, he says to her, “You came to Hollywoodexpecting that I would disappoint you. And so I did.” This was my biggest takeaway. I haven’t stopped thinking about it in the last week since I saw the movie. I starting working on a post about expectations two days before I saw the movie and now this line has me all twisted up inside. How often do I have an expectation of a person, while believing with my heart that they will disappoint me? Does it affect how I treat the person, how much I trust them? And does that affect the outcome at all? Walt implied that it did, in the case of Mrs. Travers. Though I realize that much of her expectation involved a desperate need for her to let go… and every situation involving expectations is not about letting go. Welp. I think I just ran my thought process into a circle. So this just means I have to let go, right? Here’s the thing with expectations, disappointment, and letting go. I feel like this would mean I would have to stop caring, too. Because caring is so very close to expectation (though they are certainly not mutually exclusive.) Would the absence of expectation also mean the absence of caring? So – let’s really think about this. Caring vs expectations. Is there a difference? Does removing expectation from our life mean caring will cease? If we usually expect something from a person or a situation and we remove that expectation, is it possible to still care about the person or the situation? I’m not sure I have this exactly right. Because I think we can still love the person, but perhaps removing expectations means we become indifferent to their actions. Oy. “The opposite of love is not hate, it’s indifference.” –Elie Wiesel, Holocust survivor and political activist. Still working on my word for the year… I just haven’t been able to settle on one. But I do think I will do a series on expectations. I have much more to say and am thinking about many other areas under this umbrella. The post I began working on before the quote from Saving Mr. Banks turned me all upside down will have to wait for another day. (Which is convenient, because it’s a painfully vulnerable post.) But I am going to be thinking and watching how my expectations of disappointment affect my relationships. Man, I just know this is going to be painful. My rabbi, Dennis Prager, has written extensively about 'expectations.' The less control we have of a situation, the lower our expectations should be. This can apply to relationships. When we have little influence over someone, it may be unfair to have high expectations. Additionally, high expectations can lead to unhappiness — because the more we expect, the less grateful we are for what we actually receive. And ingratitude is the mother of unhappiness. Often, having high expectations of someone else means we are trying to fit them into a mold of our own creation, which, more often than not, leads to disappointment.